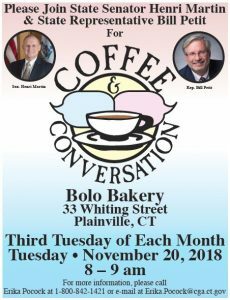 Hartford – State Rep. William A. Petit, Jr. (R-Plainville) has announced an upcoming opportunity to join he and Sen. Henri Martin for coffee and conversation on Tuesday, November 20 at Bolo Bakery & Cafe (33 Whiting Street, Plainville) from 8am – 9am. Residents are invited to join their legislators as they discuss the latest updates from the State Capitol and answer questions. The event is free and open to residents. Coffee will be served. Anyone unable to attend but wishing to contact Rep. Petit to discuss a state or local issue may call 800-842-1423 or email william.petit@housegop.ct.gov.